Evacuation order asks all people in city and surrounding areas to leave and go to Kamloops, B.C. An evacuation order has been issued for Williams Lake, B.C., and the surrounding areas due to the threat of wildfire. Roughly 12,000 people live in the city, while another 12,000 live in the surrounding areas. “We’re a little anxious at the moment. I’ll tell you that,” said Sue LaChance, one of thousands of residents driving south out of the city. A wildfire near the city has blocked the highway heading north. City officials estimate that about half of all residents have already left in the past week due to smoke from wildfires in the area. “The roads are blocked, the traffic is very, very thick,” said Mayor Walt Cobb. “We made the decision to get everybody while we could, because depending on how the fire went, we might have lost all our access out of town,” he said. Officials asked individuals in the city to leave immediately and head to Kamloops, nearly 300 kilometres southeast of Williams Lake. 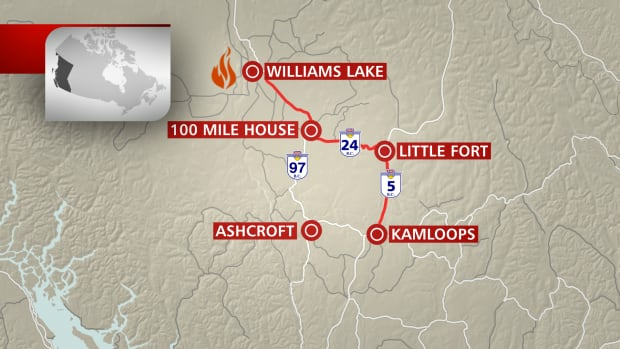 Residents should follow Highway 97 South to Highway 24 (South of 100 Mile House); follow Highway 24 to Little Fort; turn right onto Highway 5 at Little Fort and continue to Kamloops, according to a statement issued by the Cariboo Regional District. More information will be given in Little Fort at the intersection of Highway 24 and Highway 5. Shelter is being set up in Kamloops at an emergency social services reception centre at the Sandman Centre, which is located at 300 Lorne Street. Officials are asking evacuees to register with the Red Cross by calling 1‐800‐863‐6582 and have set up 500 cots at the arena and hope to add another 200. “Evacuees will be accommodated on a first come, first served basis,” said the Thompson-Nicola Regional District in a release. A Facebook page has been set up to connect evacuees with Kamloops residents willing to help. People in Williams Lake said they knew this day was coming. “We all packed, we had a week or so to get ready for this,” said LaChance. Residents who are unable to leave on their own are asked to go to one of 12 muster points in the Williams Lake, where transportation is available. Or they can call RCMP at 250-392-6261. “If you do not call, there is no way to know that you require assistance,” said the statement, while officials say they estimate around a dozen people will need assistance to leave. An evacuation order has also been ordered for people living around 150 Mile House to Polley Lake. Those affected by the order are also asked to head south to the emergency centre in Kamloops via Highway 97.